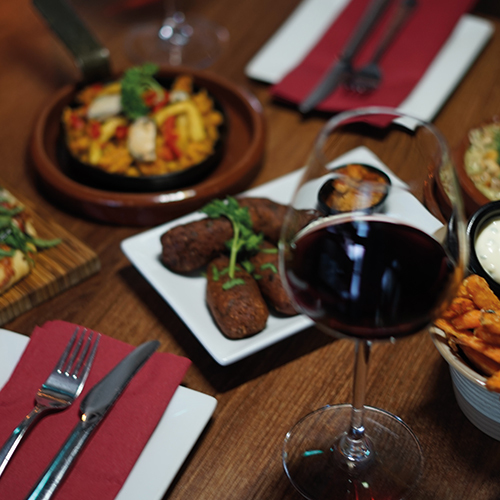 Mimosa is a lively Tapas bar that promotes a friendly ambiance with specially prepared Tapas dishes and quality wines in a great location with great staff – what more could you ask for?? Mimosa offers beautiful decor throughout the building. We are constantly updating the restaurant and menus to provide the best experience possible for our customers – even our extremely regular customers get to try new foods and drinks when they visit. We are very proud of the fact that all our Tapas, desserts, sauces & marinades are all 100% made from scratch at Mimosa. Our speciality is good food. It’s more important for us to source the best quality we can for a fair price – providing the same for our customers. All our wines are hand-picked by Oscar, Catriona and Mícheál – we try to keep up-to-date with all new trends for our wine and cocktails and are always open to try new ideas. Extend your Mimosa experience by relaxing in this beautiful setting. Residencia is located in an old, Georgian style house directly next door to Mimosa. The low-lighting and relaxed vibe compliments Mimosa perfectly – it’s the perfect place to unwind as you await your table in Mimosa, or to enjoy a drink after your visit! Residencia was always created to work in conjunction with Mimosa and our wait-list. By operating a wait-list, our customers are allowed to enjoy their experience at Mimosa in an unhurried manner – not rushing you out for the next table. Although we have expanded a lot, our wait-list can leave customers waiting for extended periods which we understand can be inconvenient. Residencia allows us to maintain our relaxed, unhurried atmosphere while reducing the time on our wait-list. Cocktails and Nibbles menus are provided at Residencia, but customers can avail of the full drinks menu available in Mimosa. We update our menus regularly and all cocktails are made by our trained mixologists using fresh ingredients – no mixes. Our Nibbles menu provides some tasty snacks as you await your table in Mimosa! Our future plans for Residencia include a 35 seated restaurant upstairs. We have many ideas for the future of Mimosa. We love how far we have come and are very excited for the future!! Mimosa Garden is a special place. Surrounded by an original wall and filled with luscious greenery, it is the perfect place to sit-back, relax and enjoy the whole Mimosa experience. We have a beautiful heated terrace overlooking the garden. During the summer our customers are welcomed to dine on our terrace or on one side or our garden. A warm summers evening is the best time to visit Mimosa garden, listen to the birds sing as you sip on a glass of wine – heaven! A resident Robin currently occupies the Mimosa garden who we cherish. Our staff and customers are huge fans and we hope he/she continues to visit.